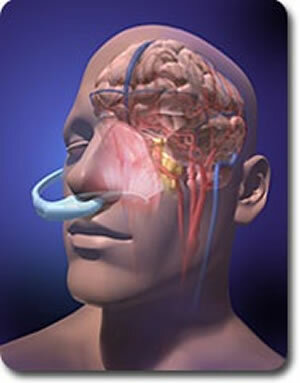 The RhinoChill IntraNasal Cooling System is a device designed to cool the head (and thereby the rest of the body) with a nasal catheter; it is intended to be used post cardiac arrest, stroke or traumatic brain injury. 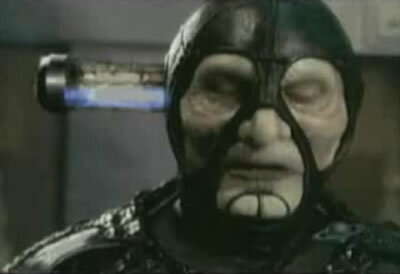 Exotic head-cooling technologies are a familiar idea to fans of the science fiction series Farscape. 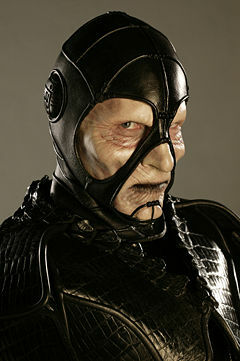 Scorpius (played by Wayne Pygram) is a half-Sebacean, half-Scarran Peacekeeper. His Scarran genetic heritage causes his body, and particularly his brain, to overheat; he compensates with a special suit. Part of the solution is in the form of coolant rods that are buried inside his brain. Sometimes, even the best coolant rods inserted into the brain just aren't enough (see Scorpius' brain overheats).